Today was Day #3 of Chocolate and Pistachio Theme Week. 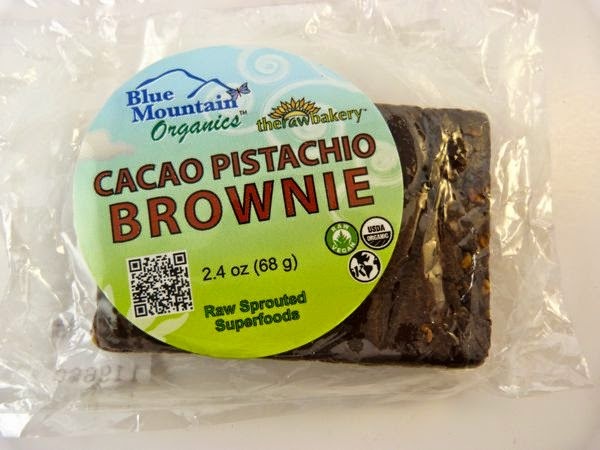 This Cacao Pistachio Brownie from Blue Mountain Organics (Floyd, VA) -- part of the company's line of raw, organic desserts and snacks -- was seriously dark. The short list of ingredients: dates, agave, cacao, pistachios and golden flax. No funny business. Despite dates and agave being listed first, this was the opposite of birthday cake sweet. Weighing in at only 10 g. of sugars, it was a breakfast brownie built for a seriously busy day. No sugar spike, just raw, sustained energy for the morning. 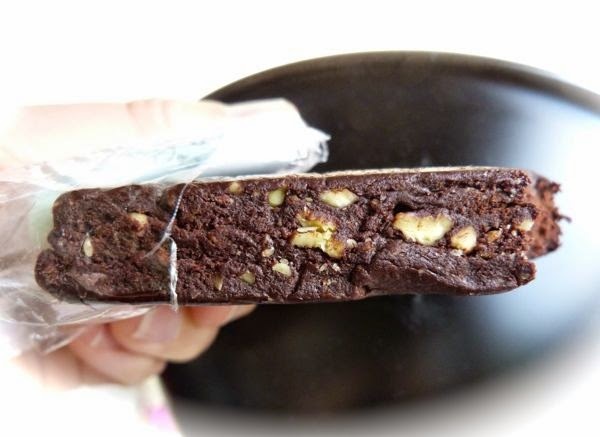 The lovely green pistachio nut bits in this brownie were a bit overpowered (as in almost all chocolates with pistachio nuts), but the nuts added some crunch and color. This brownie was non-GMO, kosher and vegan.